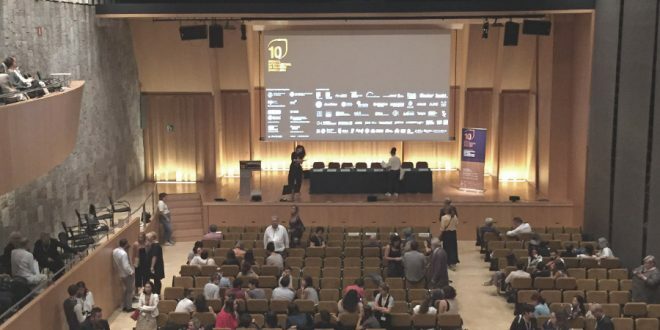 The 10th International Landscape Biennial organized by the Catalan Architect Association and the UPC University was recently held in Barcelona, Spain. 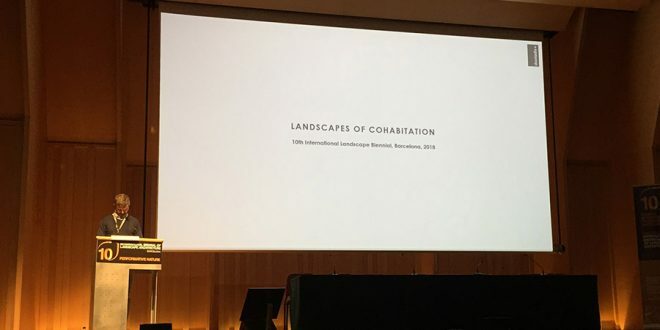 A diverse group of landscape professionals, both practitioners and academics, gathered in the COAC and the Palau de la Música Catalana to discuss about “Performative Nature”. The Event started the 25th of September and on the 28th took place the Rosa Barba Landscape Prize Award Ceremony. A number of related exhibitions and events were held in the city during the Biennial. One would ask what Performative Nature is. Nature, against any other human preconception, does perform. The processes and dynamics it encloses reveal a world in constant change and evolution, a world that absorbs damage, heals, develops resilience, in a number of ways, and persists on keep existing. What is the role of man in this breathtaking process that happens every day before our eyes, yet we hardly observe it, let alone understand it? What is the role of landscape professionals whose canvas is this vibrant, dynamic and at the same time fragile system threatened by the mindless human activity? Like in any creative discussion the questions, these days in Barcelona, had multiple answers or brought up even more questions. Our work as landscape architects has never been about green decoration. It has been about interaction and connection with the world around us, in order to satisfy human needs and respect nature. All in the same subtle, evident, minimum, design gesture. We should not only be aware of the Performative nature of… Nature but also integrate this quality in our work in ways and methods we have never thought before. The numerous professionals and special speakers those days in Barcelona had to share many diverse and interesting perspectives on the subject. Professor Yang Rui from China argued on what the term “Performative Nature” means in Chinese landscape architecture. He offered an interpretation in both traditional and contemporary context. And concluded with the ambitious thought: “Make China beautiful again”. Brian Davis from the other side of the planet (U.S.A.) talked on how humans are […unable to relate with coastal landscape in its own terms…] arguing that the fact we like it so much leads us to destroy it. He explained the way certain practices like dredging affect the form and performance of a landscape and analyzed how this could be integrated in the shape of contemporary landforms. 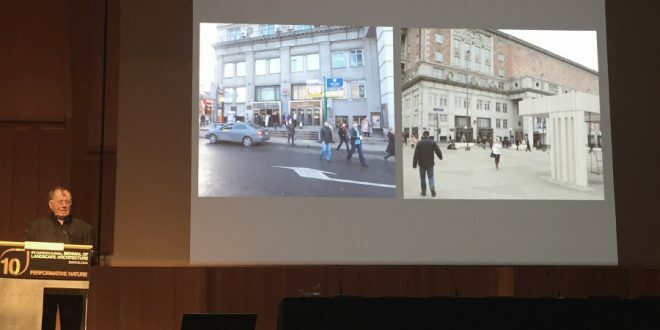 Jan Gehl from Denmark gave an inspiring speech on how to improve everyday life in contemporary cities. He presented actual examples from Moscow and Copenhagen. However, he expressed the concern that though we work hard to improve the existing cities we do not incorporate the acquired knowledge and experience when designing new ones. He commented that new cities should incorporate sustainability and high quality living from the very beginning. 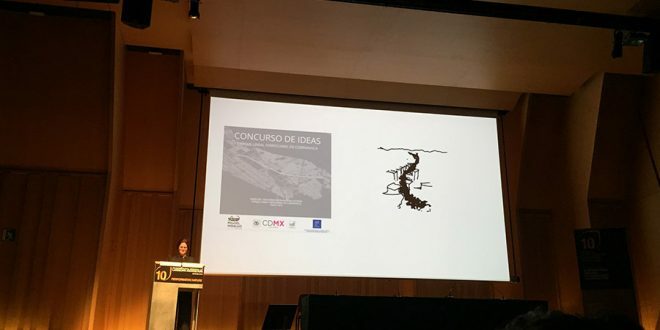 The Argentinean landscape architect Teresa Moller talked on how landscape architecture heals community life and reminds us that “We are nature”. She presented a number of subtle and delicate projects her practice has worked on. The interventions merge with the iconic landscape around them in a very sensible and sensitive manner. Walter Hood gave a whole different tone to the discourse when he said that: “Landscape can be messy and we can be messy in it”. He argued on racial identity as part of landscape integrity and how we should reinforce the places people live in, offering a social dimension on the way of working and designing with landscape. Among the speakers there were also Michael Jacob professor at Hepia and HEAD, Geneva and at the Grenoble University, Nina Marie Lister MCIP, RPP. Graduate program director and associate professor in the School of Urban and Regional Planning at Ryerson University, Toronto, founding principal of the PLANDFORM studio and Nicolas Bourriaud theoretician of art and aesthetics. Further information on the lecturers found on this link. The aim of this award is to distinguish the landscape project that actually adds a new value on how landscape architecture evolves and changes up to the present moment. All nine finalists had something new to contribute to the discussion. Suffice to mention that the final selection was the result of the submission of numerous projects from all around the world. There were projects that included extended landscape interventions, others that tackled with social issues and some that presented approaches with great sensibility and simplicity almost of an artistic value. 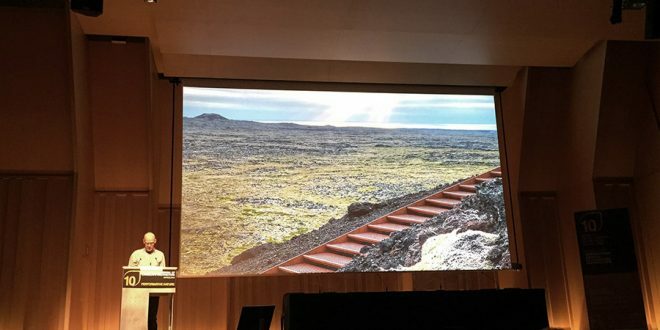 The Winner of the Rosa Barba prize is “Saxhóll Crater Stairway” by LANDSLAG EHF. The intervention is a curved stairway leading to Saxhóll, a 45 meter high volcanic, oval shaped crater in Iceland. The project is characterized by simplicity, subtlety and it is completely reversible. It unfolds elegantly on the steep topography ensuring an easy and comfortable route to the top of the volcano. 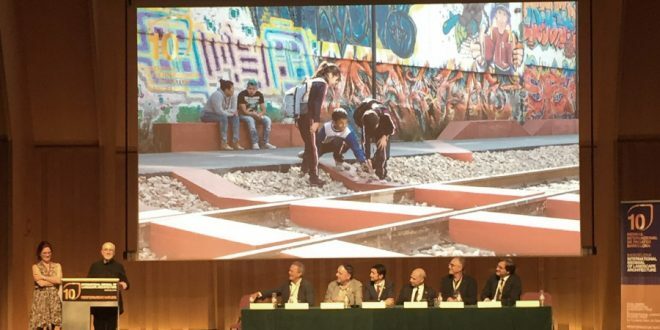 The project “Linear Park Cuernavaca Railroad” by JULIO GAETA and LUBY SPRINGALL was awarded with a special mention from the international jury and also won the Public Opinion Prize. The Park unravels along the railway lines that connect and at the same time divide the adjacent neighborhoods. 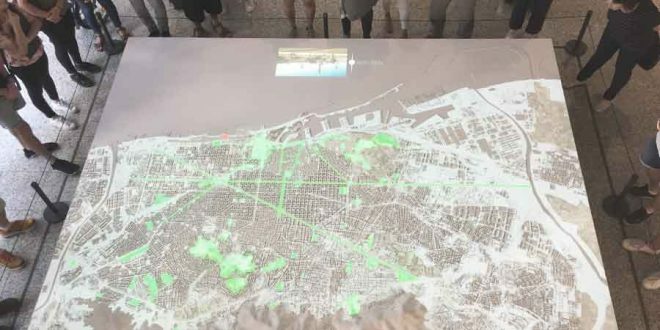 It has offered the citizens a public place to enjoy, coexist and connect with each other despite the hard social context, the reactions and the reservations the design team was initially confronted with. 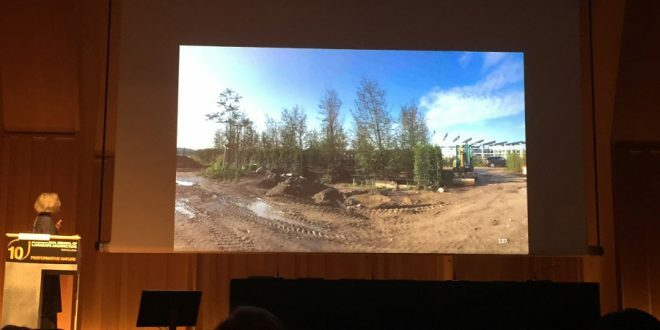 The International Landscape School’s Prize was awarded to RE-ACTING TO PLACE: Individual Investigations into the Performance of Landscape, University of Edinburgh and there was also awarded a special mention to AHO Oslo school of architecture and design. The project “Landscapes of Cohabitation” by the landscape practice “Doxiadis+” was among the finalists for the prize. This is the first Greek candidacy for the Prize in the twenty years of the Biennial. ♦ Further information on the Prize awarded projects is on the link. ♦ The Finalist projects are found here. ♦ Information for the International Jury members is here. Attending numerous lectures and discussions during these intensive, long and inspiring days in Barcelona I have left with many things to remember and even more to contemplate on. I realized once more that our work as landscape architects has never been about aesthetics and it has become more evident than ever. Beauty derives from coherence and integrity more than the urge for aesthetic satisfaction. There seems no room for vanity or personal glory when one tackles issues of great complexity in a massive scale. We need to act together rather than fight alone. I was led to the conclusion that awareness and constant reconsideration of our actions will ensure the success of our work to the higher possible extend. Discussing about landscape architecture in a city like Barcelona, that has set new standards in the field of contemporary landscape and urban design is very motivating. You actually believe anything is feasible in this context. No wonder why in the Biennial vision and reality merge so effortlessly! 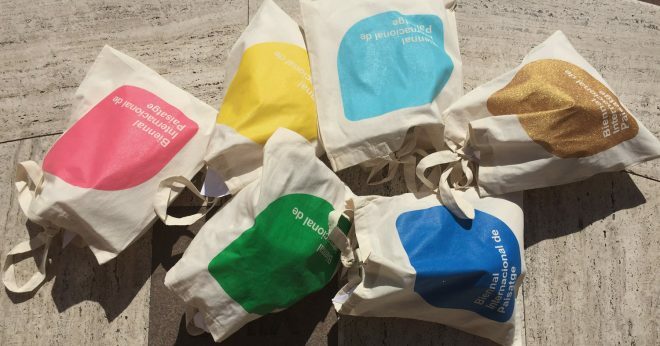 Till the next Biennial in sunny and beautiful Barcelona! Many special thanks to the Scientific Committee of the Biennial and especially Marina Cervera for the opportunity to attend the Event.